New commander "Logistic Support Tactics"
Unless you're playing a huge map like General Mud, I don't see the point of the ambulance when you can just upgrade HQ with nurses. Three of the abilities are for conscripts, though i'm fine with RPG-40s and Conscript SMGs. Rapid Conscription however is pointless. Fuel drop i believe is still broken in that planes can still shoot it down, so you spend 100 munitions for nothing. But however, we should not forget that it is supporting the commander, "Supply rear". I think it's a normal commander. Good ability, in addition to "shipping fuel". It is incorrect in the game for the Soviet. Comisar squad instead of grd assault, with retreat point to cooperate with ambulance. 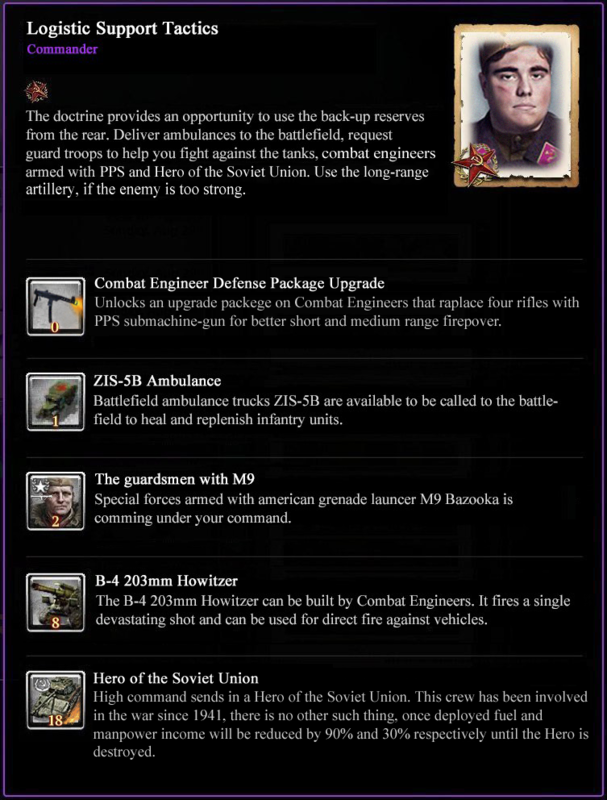 The commander looks decent, but I'd like to see a few original abilities instead of old ones - Soviet commanders already have a lot of overlap. I also recommend using a ZIS-6 for the ambulance, because there's a model for it in the game. Can we retreat to the ambulance? That would be great as there no forward retreat point for soviets in any commanders. Maybe adding a retreat point upgrade on the ambulance would make it very attractive. Allied supply drop is not really great in the current scenario. I would suggest to change it to supply half track which drop ptrs rifles/ppsh depending on his choice for some munitions. This will synergise well with AT grenade assault. Rapid conscription is already in some commanders and only works well if you spam lot of cons. This could be replaced with some offmap artillery (not incendiary). Soviets really need this as they float munitions. You can replace any one of the above to add IS2 or some heavy tank to add late game power to it. Overall, I believe that this commander, with some tweaks, can result in very aggressive play (especially using penals ) with completely different play style (Just like urban defence). I hope we can see this commander soon in market. Wish you good luck comrade. Combat Engineers can salvage vehicle wrecks and abandoned equipment to gain fuel. (The same ability OKW has.) They can also use cheap PMD-6 anti-personnel mines. Ambulance: Transport is disabled. It gains a healing aura like the USF Ambulance. Supply Truck: Transport and reinforcement are disabled. 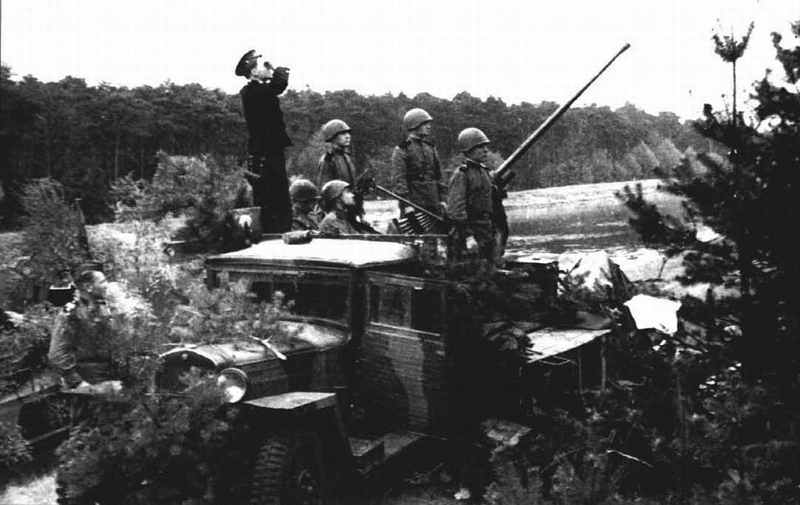 It can set up in owned territory to increase resource income, like the Wehrmacht Opel Blitz. Instead of Molotov Cocktails, Conscripts can use RG-42 fragmentation grenades. Instead of RPG-43 AT grenades, they can use improved RPG-6 AT grenades with better range and penetration. They can also upgrade to one DP-28 LMG for 40 munitions. I have some similar stuff in my commander mod. 1. Can we retreat to the ambulance? That would be great as there no forward retreat point for soviets in any commanders. Maybe adding a retreat point upgrade on the ambulance would make it very attractive. 2. Allied supply drop is not really great in the current scenario. I would suggest to change it to supply half track which drop ptrs rifles/ppsh depending on his choice for some munitions. This will synergise well with AT grenade assault. 3. Rapid conscription is already in some commanders and only works well if you spam lot of cons. This could be replaced with some offmap artillery (not incendiary). Soviets really need this as they float munitions. 4. You can replace any one of the above to add IS2 or some heavy tank to add late game power to it. I personally prefer a squad for a forward retreat point. The truck would inevitably be slow, cost fuel, and very fragile, whereas a squad can at least retreat and/or reinforce, and make use of cover. -There's already an Engineer Salvage Kit, which actually performs better since it grants manpower, fuel and muni as it trains wrecks. Your idea not only copies OKW's feature, but adds more on top. -Truck is okay, but it competes with M5 halftrack and copies HQ nurses and Ostheer's Opel truck. Considering the supposed theme of the commander, I'd say it can be toggled to deploy mechanics; while it's similar to Industry's repair points, it's mobile and cost fuel and manpower plus popcap (as opposed to muni). Worst case scenario just make this the repair point, it's only found in one commander. -Straight up making Conscripts replace Shocks and Guards? At least spread it out so Penals get something rather than it all rely on Conscript spam. this unit can fire twelve 300mm rocket barrage on its target (this unit must be limited to only two trucks on the field) and require's 12cp to unlock! Guardsmen/Soviets are fine without bazooka, even the upcoming patch will give Penals PTRS.